Are you a Roofer? Home Owner? Builder? 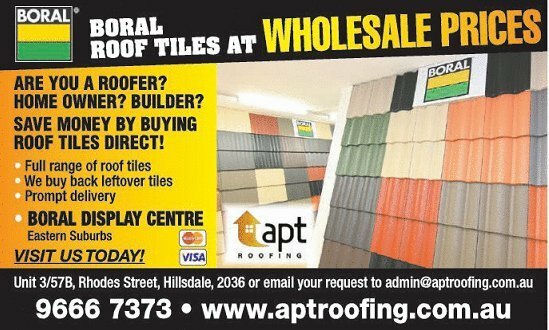 Apt Roofing Pty Ltd is proud to announce the opening of the first and only full roofing display center in the Eastern Suburbs. A full display of all Boral roof tiles is available. Please visit us at 3/57B Rhodes St, Hillsdale (just off Beauchamp Rd) to discuss the colour options with our friendly staff. 1. Wholesales price! - You save on every roof tile you buy! 2. Prompt on site delivery! - You don't need to worry about logistic side of it! 3. We buy back leftover tiles! * (conditions apply) - No risk for you to end up with full pallet of tiles which has been over ordered. 4. Full range of colours available in the showroom next to you! - You can choose the colour before you commit to the order. All you need to do - FIND the roofing contractor who will do the labor part of the job.You can easily safe a lot of dollars depending how big your roof is. SAVE MONEY BUY BYING THE ROOF TILES DIRECT! Please email us you house plan and start saving today! We will get back to you in 48 hours with the quote.